Does God Really Want You? -- and who is this Hound of Heaven? It wasn’t long before he showed up on the balcony, glad to share a few minutes chatting with me. How was it that he always seemed to find me? I wondered. And to this day, I still wonder that. Oh, I’ve given up running from him. After I finally turned around and realized what a wonderful man he was, I was glad for the pursuit. It’s interesting it how love works, isn’t it? I’m sure we all have our favorite romance stories in books, movies or real life. And they usually have one thing in common – there’s almost always a pursuit. Recently, I’ve been reading the book, “Experiencing God,” and in it, the authors Henry T. Blackaby and Claude V. King, have uncovered something in God’s nature that I’ve never thought about before. It’s true when you really think about it. If you’re a Christian already, you probably remember those early days of your faith when your heart began to awaken and your ears became more sensitive to the voice of God. I remember when I first started experiencing this. I thought I knew God well enough, but when I saw a friend call herself a Christian and really stand on her faith, I became aware of my own lack. And I remember when the Holy Spirit tugged on my heart so hard, that I just had to respond to an altar call at my friend’s church. That night at the altar, I prayed the prayer then that changes all things and put Christ in his rightful place as Lord over my life. But you know, I don’t think I would have done it if God hadn’t pursued me first. Using the examples of folks in the Old Testament like Noah, Abraham and Moses and some in the New Testament like Jesus’ disciples and the apostle Paul, Blackaby and King say that God repeatedly initiated a relationship with each one. “Sin has affected us so deeply that no one seeks after God on his own initiative. "Therefore, if we are to have any relationship with Him or His Son, God will have to take the initiative. "This is exactly what He does. God draws us to Himself. … The Love that God focuses on your life is an everlasting love. I have a very old book in my study that’s an interpretation of “The Hound of Heaven,” by the English poet Francis Thompson (1859-1907). I’ve never read the book, but I’ve always been fascinated by it’s title. I love the analogy of the hound because it shows the fierceness and unrelenting passion of our loving God who desires that no one should perish. 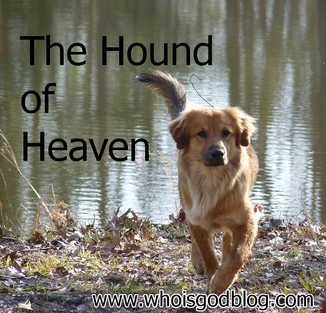 As the hound of heaven pursues you, may you always be willing to give him the one thing he so earnestly seeks.